Chris Marker is in the pantheon of the artists who have had a profound impact on my life. I do not remember when I first saw La jetée (1962), but it must have been in a film class in the early eighties. Though my degree was Theoretical Physics I often sat in on films with or without the permission of the lecturer. When I realised after four years I was one credit short of my papers, I took a film course to wrap things up. By this point I was buying photo roman when I found them at local used bookshops, this being the easiest way to "see" certain films I had no access to. It took a long while before I managed to view A Grin Without a Cat (1977), Sans Soleil (1983), and Level 5 (1996). To these I should add important works by Alain Resnais: Nuit et brouillard (1955), on which Marker worked, and L'Année dernière à Marienbad (1961), one of the supreme achievements of film. I still can't say I have any special knowledge of Marker's work. In fact, I can't recall many details from A Grin Without a Cat. Did I really see it? Well, that is a very Marker question. And because of Marker I am happy to leave it as an open point. Why fill in the gaps between, when the gaps are what generate life and meaning? This I truly believe. And, though I would never deny I am largely incorporated into contemporary society, I live my life this way to an extent that is sometimes surprising (to me, anyway). In the nineties I collaborated on a CD-ROM project (with Chris Keep) as part of my ongoing investigation into links and spaces. Terminal was a hypertext fiction composed of text and stills, before the World Wide Web brought this structure into everyone's lives. It was so difficult to explain back then, because there were no models you could point to. It is so difficult to explain now, because everyone takes the web for granted. And so infrequently does it demonstrate its potential. Before the year is out, my publishing company, Stolen Mirror, will release a photo roman, a "flattened" multimedia; that is, a book of the CD-ROM of the hypertext of Terminal. It would have been nice to have sent a copy of this "finished" work to Chris Marker, without whom it would never have happened. Now that opportunity has vanished. I just got back from delivering the paper "Becoming Noise" in Cork. This I dedicated to the memory of Chris Marker -- and that is some sort of a pun. "The act of remembering is not the opposite of forgetting," he said. 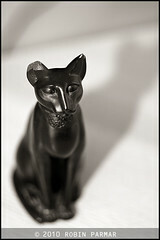 On the table before me as I spoke was the Egyptian cat figure pictured above. Some sort of a totem. I will never forget Marker, even though I might rarely be conscious of remembering him. That was his gift. Marker's photos are available at Peter Blum. A rare interview is available here. If you have a Mac, buy his CD-ROM Immemory. The best place to start with his films is the DVD collecting two masterworks: La Jetee and Sans Soleil. Blu-Ray versions are also available. Note that the Criterion version available in N. America has extras that the cheaper UK version lacks entirely. If you buy through these links a bit of the Amazon's profit comes back to me. While I have never actually made a penny this way, there is no harm in trying! If you choose instead to support your local retailer, I am happy. One way or another, watch these films!